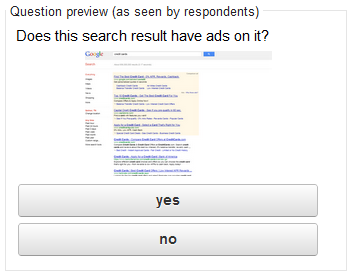 For the following study, we asked “Does this search result have ads on it? ” to 1,000 searchers, per search results. 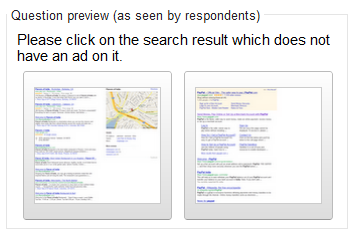 Due to these surveys requiring a smaller image (to fit the ad unit size) we chose search results that generally had more ads on them (typically 3 or 4) so that the background had a significant portion of real estate devoted to ads, in spite of its small size. The one exception here was DuckDuckGo, as it only displays one ad at most even on highly commercial keywords like credit cards. Other than resizing the search result to fit, the only modifications we generally made were removing the graphic picture from the Wikipedia page near the top of the DuckDuckGo SERP (since a prior study showed that users presumed there was a correlation between graphics and the perception of ads) and that in most cases we removed the right sidebar. We did include the sidebar ads on 3 different Bing, Google, & Yahoo! search results so that we could compare the impact of sidebar ads vs not having a sidebar. 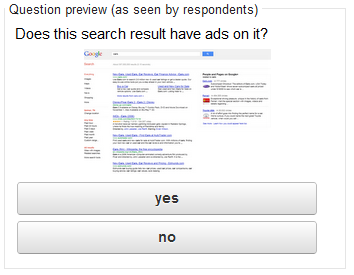 For most search engines, people are generally unaware of ads vs organic results if there are no ads in the right column … most of these yes/no questions came down to about a 50/50 vote, even though all of them had ads on them. It is every bit as true today as it was in 2003. 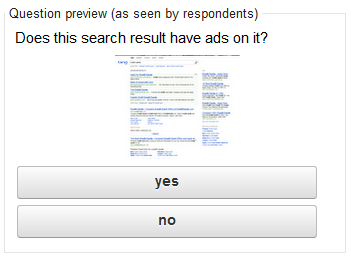 If there is a right column, the percent of people who voted that there are ads on the page jumps significantly. 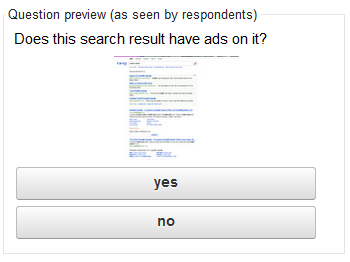 Thus it is pretty safe to say that people think ads are in the right column & that the right column is ads. In part perhaps due to placement and a lack of user knowledge between ads vs content, paid ads do significantly cannibalize organic traffic. SERP heat maps have shown heavy focus on the left column. This is perhaps why Google feels comfortable putting brand oriented Google+ promotions in the right column, while they put further ads at the bottom of the organic search results – people tend to view the left rail as organic search results and the right rail as ads. In the past Google also stated that graphic product ads in the right column got about double the CTR of text ads in the same location, thus if Google ever offers search-branding graphical campaigns I would expect those to primarily appear in the right column. 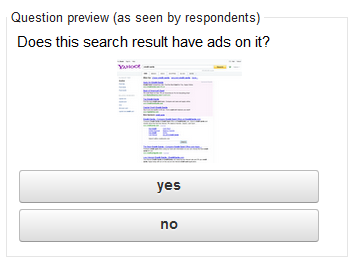 Interestingly, among major search engines, Yahoo! 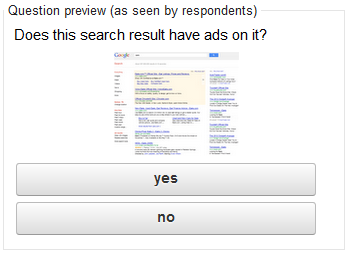 (without sidebar) got more “yes, it has ads” votes than other search engines. In fact, Yahoo! without sidebar ads scored within 1% of Bing with sidebar ads. Years ago they decided to get out of search in part because they under-monetized competitors (in part due to paying arbitrages to destroy their click value by pumping their network full of fraudulent clicks). Advertisers didn’t even have a mechanism to opt out of such scammy ad syndication until AFTER Yahoo! signed the search deal with Bing. Yahoo! still under-monetizes search (& complains about it publicly, blaming Bing) in part because Bing cut out a lot of the arbitrage, in part due to ad matching issues on longtail queries, and in part because Yahoo!’s ad background color is more noticeable to users, where other portals and search companies like Google & Bing blend it in so well that many users simply can not see it, particularly on laptops and older computers. 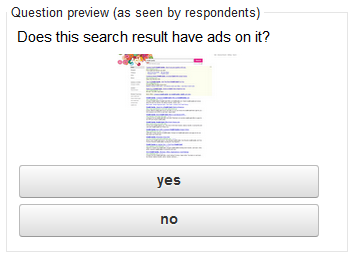 Ask is the most aggressive ad blender of all search engines. 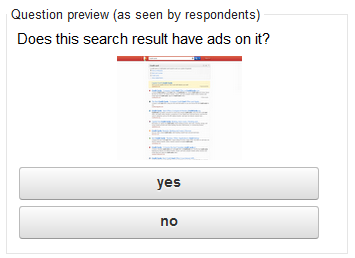 If you click through to their results from a Google ad it plants a cookie to remove the background color on the Ask search result ads on all subsequent searches until you clear that cookie. 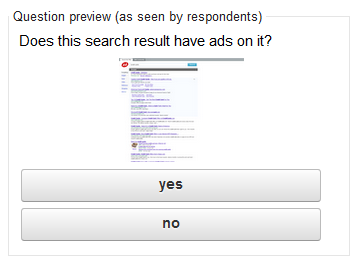 For the question Does this search results have ads on it? Prior to doing the above study, we asked users to please click on the search result which has an ad in it, listing search results side by side. Any bias presented in this (outside of both having smaller than actual sizes) impacts both images. At first we did a regular Google SERP where we included the branding & then we followed up with one that is more zoomed in on the actual search results but does not include branding. On the one that was less zoomed in people thought the map was an ad more often, but upon further zooming they thought it was roughly 50/50. Does this search result have ads on it? 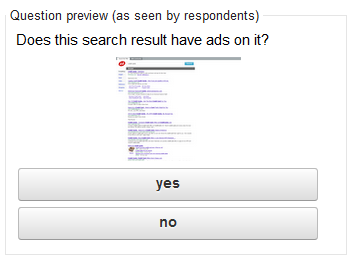 Searchers tend to think that Google+ integration in the right rail is an ad unit. More people voted that Google+ without ads had ads in the search results than a SERP with 4 AdWords ad units and no Google+ integration. After seeing that users generally guessed no better than a coin toss at best in most cases, we decided to ask What background color do Google search results use to denote top left search advertisements? 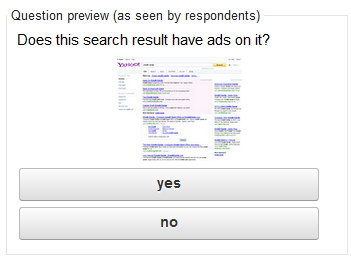 The same question was asked of Yahoo! & Bing search results. Bing scored highest, however blue also scored as the 2nd highest color for all 3 search engines. Nearly half of searchers believe that top ads have a white background, which highlights a general widespread lack of awareness of search ads. Given how little awareness users have of ad background color, I decided to ask: Where might ads appear on search results at top search engines like Bing & Google? Less than 3 in 10 answered the question correctly & nearly 20% of people do not think search results carry any ads, which explains how an algorithmic penalty can create a bad quarter, why Google was sued in Australia for misleading ads & why the Rosetta Stone vs Google case was overturned. Next time you hear a search engineer talk about clearly labeling paid links, ask them why they do such a poor job of it themselves! Ever since search engines have weeded out some of the more exploitative reverse billing fraud ads, trust in online ads has been growing. Based on the above, we wanted to see how users perceive ads vs organic search results, so I asked: Search engines include both algorithmic search results and ads in them. Which do you trust more? 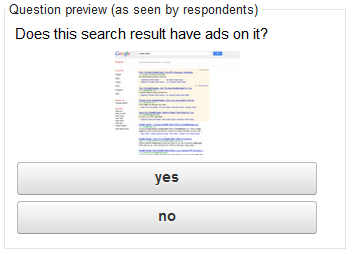 One of the bigger issues with Google’s current survey solution is that you are limited to rather small sized images. Such limitations do not harm asking a question like “what color does Google use for x” but they do make the search result a bit harder to see. To compensate for that problem we ran a separate survey on AYTM, where users were able to view a search result in full screen mode for 10 seconds & then they were asked 3 questions. The purpose of the first question was to put a few seconds in between them seeing the image and them answering the second question. One other improvement that was made here (in addition to allowing users to see a larger sized search result image) was that we added an “I am not sure” answer to the questions. Below are the responses in table + graphic form, followed by the AYTM widget. 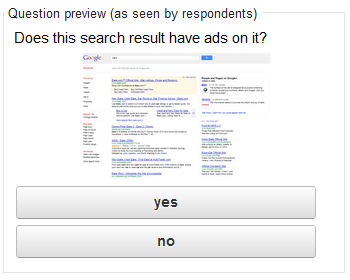 Where May Ads Appear on Google’s Search Results Page? Did the Viewed Search Result Have Any Ads On It? What Background Color Does Google Use to Denote Ads At the Top Left of Their Search Results? 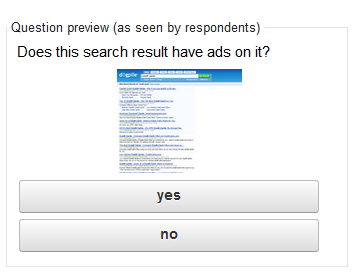 Even directly after viewing a search result with 3 ads in it, most users are uncertain of where ads may appear, what color the ads are, and if the search result even had any ads in it! In a RGB color space, hex #fef7e6 is composed of 99.6% red, 96.9% green and 90.2% blue. Whereas in a CMYK color space, it is composed of 0% cyan, 2.8% magenta, 9.4% yellow and 0.4% black. It has a hue angle of 42.5 degrees, a saturation of 92.3% and a lightness of 94.9%. #fef7e6 color hex could be obtained by blending #ffffff with #fdefcd. . If you have an older monitor or a laptop which you are viewing at an angle these colors are nearly impossible to see. 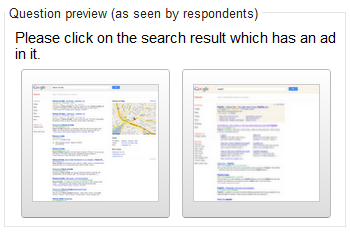 Here is the AYTM widget of the above 1,000 person survey, which you can embed in your website.